On Nov. 13, 2012, the Moderate Resolution Imaging Spectroradiometer (MODIS) on NASA’s Terra satellite captured this view of cloud streets amidst northwesterly winds over Hudson Bay. Trapped beneath a warm air layer and directed by a cold northwesterly wind, fluffy cumulus clouds line up in bands called 'cloud streets' in an image captured Nov. 13 by NASA's Terra satellite. The visible light image by the satellite's Moderate Resolution Imaging Spectroradiometer (MODIS) shows skinny, northwest-oriented clouds filling Hudson Bay in northeastern Canada. 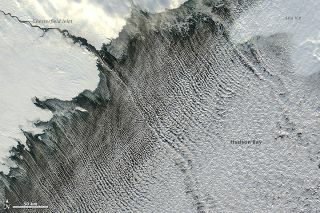 Cloud streets — long parallel bands of cumulus clouds — form when cold air blows over warmer waters, while warmer air called an inversion layer rests on top of both, according to NASA's Earth Observatory. When heat and moisture from the comparatively warm water rise through the cold air above, the rising thermals hit the inversion layer, which acts like a lid. The thermals roll over and loop back on themselves, creating parallel cylinders of rotating air. As this happens, the moisture in the warm air cools and condenses into flat-bottomed, fluffy-topped cumulus clouds that line up parallel to the prevailing wind.